Everybody’s got something, something they just can’t quite get enough of. I have a friend who, for example, goes wild for shoes. She loves shoes and she ‘must’ have the perfect shoe for every occasion. Or my other friend who loves pens. She carries various pens in her purse so that she is fully prepared for any type of paper she may find herself writing on. The weight, the size, the colour, the thickness of the nib, and the overall feel of each pen has been carefully considered. Why do I bring this up? Well, it occurred to me today that the way I feel about Adho Mukha Svanasana is kind of how my friends feel about their shoes, their pens, and the many other things people are oddly attracted to :). To me, no matter the state of my mind or body, there is always a perfect Adho Mukha Svanasana just waiting to be had. I admit, Adho Mukha Svanasana is one of my favourite poses. I love it because it’s got a bit of everything. You get to work the legs, the arms, provide (a most delectable!) traction to the spine, and on top of all that, you get the benefits of being inverted. I also love that this pose is highly accessible. Not only can it be practiced just about anywhere, but it’s also a pose that you learn early on. 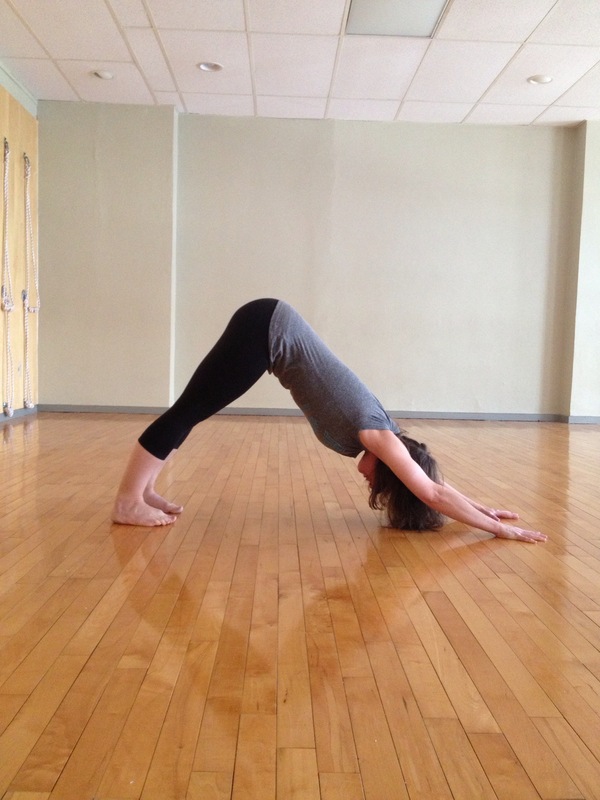 Beginner or experienced, all practitioners have something to gain from Adho Mukha Svanasana! If I’m warming up before class or getting ready to practice, I’ll often do Adho Mukha Svanasana with support from the ropes. This photograph shows a variation where the lower rope is inserted into the upper rope and then used to lift the outer corners of the hips up and back. There’s something about the angle of the ropes that to me, feels incredibly good. I feel like it provides the perfect amount of support while still challenging my limbs to find their consciousness. If my low back is bothering me, this is the variation I most often use to give my spine the traction it needs to release itself. 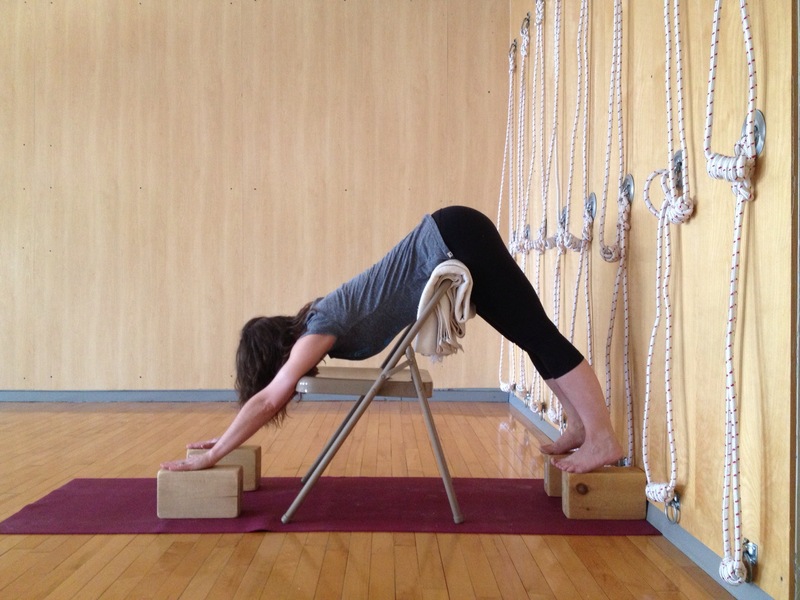 If I’ve spent too much time working at my computer, or for no good reason woke up with a kink in my neck, I like to practice Adho Mukha Svanasana with my hands on blocks. I dig the heel of my hand into the edge of the block lifting my fingers as high as possible. Then, rolling my upper arms out I quite literally rebound off the blocks to lift my hip corners up and back. What I love about this variation is that having the palms raised in this manner allows me to access my shoulder blades much more deeply than otherwise. In particular, it draws my focus to the inner line (closest to the spine) of the shoulder blade. Also, the activation of the outer line of the upper arm is more available here and this helps me to work more effectively with the carrying angle in my arms. Now, let’s say I want to give my spine the same traction that I get when using the ropes but I don’t want to take the support. In this case, I’d do Adho Mukha Svanasana with my heels digging into the edge of the blocks. Similar to how I worked with the hands in the previous variation, here I lengthen the sole of the foot forward and lift it up as much as possible. I like this variation because it really teaches me about the back of my legs. When I’m working well in this pose, I can feel incredible breadth across the back of the thighs and an opening of the knees. It was also in this variation that I first began to experience the mula bandha. If I’m anxious or stressed, I find supported inversions are like my own personal reset button – they bring my levels back to equilibrium. Adho Mukha Svanasana over a chair is extremely supported and thus allows me to spend a good amount of time in the pose without struggle. If I’m feeling high strung (which I admit, does happen occasionally :)), I will almost always include a supported Adho Mukha Svanasana into my practice. This variation with a chair is particularly useful if you find yourself without access to a rope wall. There are many, MANY variations of Adho Mukha Svanasana (believe it or not, I’ve barely scratched the surface here). I wasn’t exaggerating when I said that there really is an Adho Mukha Svanasana for every occasion! What’s your favourite variation? Do you have another pose that satisfies you no matter what state you’re in? I really enjoy your words, they absolutely reflect your affection for Adho Mukha Svanasana!! My favourite pose is Sirsasana, sometimes I just feel the urge to go into Sirsasana, I absolutely love it. It gives me energy and a feel of airiness and lightness. I also do love Viparita Karani when I’m tired, it’s good for my lower back and sooooo relaxing. Ahhhh, how much I love YOGA! Thank you for such a beautiful post! I loved your variations…..the straps on the wall look amazing! I as well feel like down dog gives me a sense of coming home. Beautiful post! “down dog gives me a sense of coming home” — how true! & what a beautiful way of putting it. thank-you (!) for sharing, Karen. thank-you Azita, your comments are most meaningful. Lately, I’ve been inspired to go back to some of the so-called simple poses. It’s been an interesting process as they may be considered beginner poses but they are far from simple. So much they have to teach us!